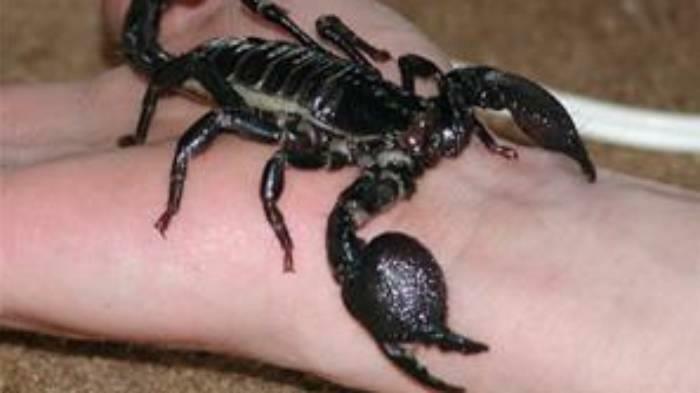 Emperor scorpions are big scorpions, with big claws and tend to look pretty scary (unless you know scorpions). They're not really scary or dangerous, but it's always fun to watch your guests be terrified. Emperors tolerated handling better than the red claw I had, but only marginally so. Basically, it's a big arachnid, it doesn't want to be petted. They will quickly relax and walk around on your hands and arms, which is kind of surreal the first few times - your body wants to freak out, but your brain knows it's pretty much harmless. If you're unlucky enough to get stung, it hurts, similar to a bee sting. I found it unpleasant, but nothing a bit of ice and some ibuprofen didn't help. I did learn a valuable lesson about annoying the scorpion though. They like to burrow, so make sure you have substrate that they can dig in as well as numerous hides. They will ambush crickets and mealworms, which can be interesting to watch. Be careful about having more than one in a tank, a friend learned that they will kill (and possibly eat) each other. They are nocturnal, so best for night people like myself. They glow under black light (like most scorpions), which can provide some entertainment. Are you sure that you want to delete this article?